Michelle Obama's missing scarf at the meeting with King Salman in Saudi Arabia, where women are required to cover their hair, has provoked hot debate on social media. Many view the first lady's decision not to wear a scarf as a political statement. Joining President Barack Obama for a condolence visit after the death of King Abdullah, the first lady was under the spotlight wearing pants, blouse and a long jacket —but no headscarf. 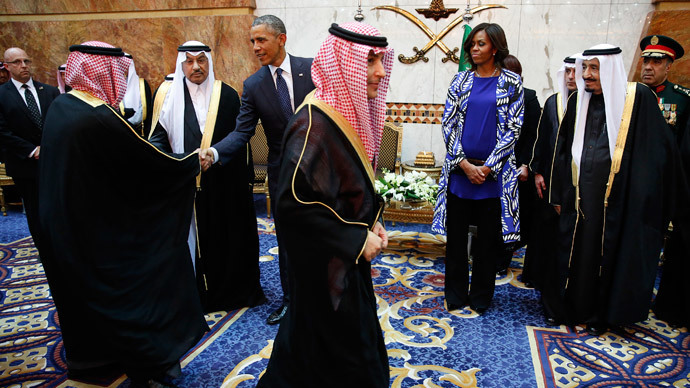 As a delegation of dozens of Saudi officials — all men — welcomed the Obamas in Riyadh, some shook hands with Mrs. Obama, while others chose to greet her only with a nod, AP reported. Under the kingdom's strict dress code, Saudi women must wear a headscarf in public. Most women cover their hair and face with the traditional niqab. Covering one's head is not required for foreigners, however. Still, over a thousand tweets were posted in Arabic with a hashtag translating as #Michelle_Obama_Immodesty or #Michelle_Obama_NotVeiled. Reports emerged alleging the first lady's face was even blurred by Saudi state television in a state TV broadcast of the official meeting between the US president and the new king on Tuesday. Local officials have denied the information, however. Michelle Obama is not the only first lady to opt not to wear a headscarf. Laura Bush didn't wear one when visiting the late Saudi King Abdullah back in 2006. In the Gulf monarchy women’s rights and conduct are regulated by strict Sharia rules, which lead to various restrictions. Saudi women are required to get permission from a male relative to travel, get married, enroll in higher education, etc. Abdullah, hailed as a "strong advocate of women", encouraged more women to go into education, and allocated them a fifth of the seats in his advisory chamber, allowing women to vote and run in the 2015 municipal elections. But other restrictions remain in place, for instance, a ban on driving.